Available in 2252, 3K, 5K, 10K and 30K ohm thermistor sensors. 1 m (40") of #26 AWG Stranded PFA Insulated and Jacketed Cables Standard. Optional 80 and 120 " Long Cable Lengths Also Available. 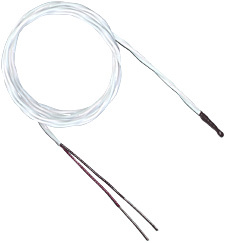 Any OMEGA’s Thermistor sensor can be supplied with additional lead wire attached to existing leads. Longer leads create more flexibility for use in many applications. The size of the potted junction between lead wire and element is kept as small as possible. Note: These elements are not intended for direct immersion into liquids. Configurations shown below include 1 meter (40") long cables. Nota: Notes: For additional cable length, add required length to end of the model number and $2.60/meter ($0.80/ft) to the price. For a phone plug, add "-PP" to the model number and add $7 to the price.